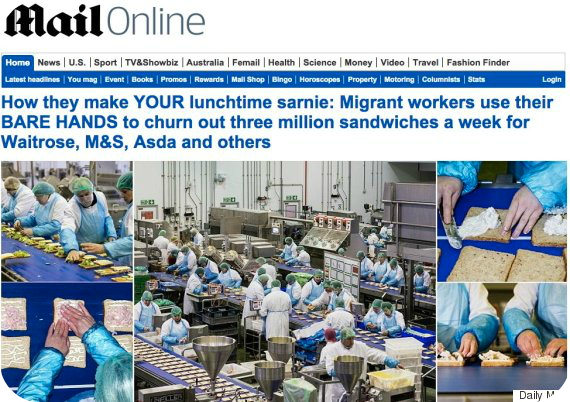 Shocking as it might be to the sensibilities of people who don't prep food for a living, it is often done with bare hands. Some countries insist on a barrier method for ready to eat foods, but the UK is not one of them. Because the thing about gloves is that they can give a false sense of good hygiene. They're not made out of some miracle substance; dirt from hands can still pass through onto food, and vice versa, but people are often much less stringent about not touching their face, regular hand washing, etc, when wearing gloves. 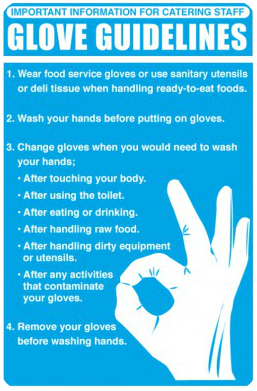 You would more than likely notice stray food, juices, or a scrape on your hand - but you may well not on a glove, increasing the chances of cross food contamination and pieces of torn glove ending up in someone's lunch. If gloves are not used properly the risk is amplified - the moist environment inside the glove is a bacterial paradise. The comments, naturally, were full of people vowing never to eat pre-packaged sandwiches again. It's like we've become so fundamentally divorced from the process of food preparation that we picture it all being done by machine, in a completely sterile environment. I don't wear gloves to make a sandwich at home, and I wouldn't expect a friend or relation making me a sandwich to do so either. In a food prep environment, with regular hand washing and stringent health and safety procedures, the risk is way less than in either of those scenarios.